So, you’ve decided to start your blog. Good for you! Blogging is fun, interesting, addictive, and even profitable if you get very good at it. That’s why so many people around the world become bloggers. 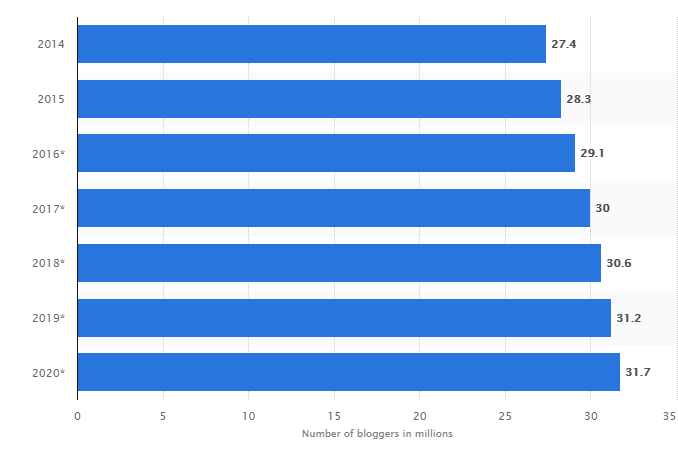 While it’s almost impossible to provide exact data on how many blogs are out there, Statista suggests that the current number of bloggers U.S. is about 30.6 million. As you can see, this number is set to reach 31.7 million users in 2020, so it’s clear that the industry will continue to attract lots of new people. These people join blogging because of different reasons. For example, some of them are there to make money while others just want to document their thoughts online. Regardless of the reason why you decided to become a blogger, you’re most likely to encounter a number of challenges along with way. Everyone entering this business does. Ultimately, your success in this industry depends on your ability to overcome them and get back up stronger and wiser. This post is dedicated to those bloggers who just started blogging or planning to start a blog. Here, you’ll learn about four common problems you may face along the way and ways to overcome them and become a successful blogger. Many bloggers choose to write about something they like or enjoy. Chances are, you did that as well. That’s a smart move, actually, because writing about something you like or enjoy will keep your motivation going strong for a long time. However, many new bloggers make a mistake by trying to tackle the entire area of their interest. For example, let’s suppose you’re a fan of basketball. It’s a beautiful sport and millions of people love it, so the audience and potential for revenues are good. In the beginning, you get extremely excited and write everything you know about basketball: news, how-to articles, tutorials, player biographies, basketball movies, predictions, and more. This is a big mistake. If you’re not writing on behalf of a business that has clearly defined topics, producing content on diverse topics will confuse a lot of your readers. A person visiting your blog may be interested in basketball, but what are the chances that he or she is 100 percent obsessed with the game and everything that is remotely related to it like you are? To be memorable to visitors, you have to focus on a certain area of basketball (or whatever field you’ve chosen for your blog) and try to become a master by consistently writing about that area. For example, you can write about how to develop certain basketball skills or NBA (National Basketball Association) news. As the result, you’ll avoid being a jack-of-all-trades and a master of none. Let’s suppose you’ve chosen an industry and a niche to write about. Now, your main task is to create outstanding content that will keep your reader return for more. It’s quite difficult for both new and experienced bloggers because coming up with fresh and exciting ideas could be challenging after a few months of writing. As the result, the quality of content may suffer, and the readers feel that, too. A content of a blogger who’s facing an obstacle such as a lack of compelling ideas is unengaging and irrelevant. Ultimately, a blog will lose traffic. And it’s not that only new bloggers have this problem. 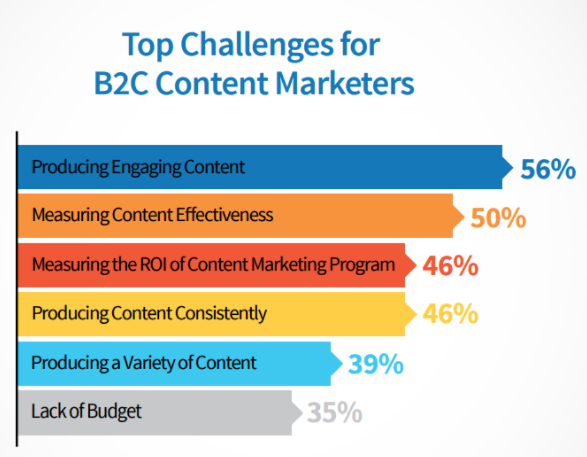 According to 2016 Benchmarks, Budgets, and Trends – North America by Content Marketing Institute, producing engaging content was number one challenge for B2C content marketers as well. Clearly, you have to know how to overcome this challenge before you face it. Here are some pointers for you. If after months of writing you feel like you’re struggling with new and fresh content ideas, you can use free online tools like BuzzSumo and HubSpot’s Blog Ideas Generator. BuzzSumo is an amazing tool that allows finding the content that receives most engagement on social media. For example, let’s again suppose that you’re running a blog about basketball, so you need to find what basketball-related news are currently enjoying most of the social media users’ review, shares, and engagements. Type various keyword phrases such as “NBA news,” “basketball skills development” and other related to your blog’s niche and the tool will generate the list with the most popular articles at the moment. If you see something you like, you can write about it. Next, HubSpot’s Blog Ideas Generator and Portent Content Idea Generator are tools designed specifically to help you come up with title ideas. All you need is the keywords related to the niche of your blog. For example, here’s what Portent Content Idea Generator came up with when given “NBA” as a keyword: “20 Insane (But True) Things about NBA.” That’s pretty good! Using tools like these will help you to come up with more interesting titles even after a few months of writing. One of the main purposes of online content is to persuade readers to take a certain action. In many cases, this action is buying. As a frequent blog reader yourself, you know that many bloggers try to pitch their readers with marketing messages, and often they do it very aggressively. Some beginner bloggers who are under immense pressure to make their first buck make this mistake as well. They choose to ignore the fact that most of the people out there are sick and tired of being sold to. So, if you choose to pitch your readers with promotional messages, many of them will quickly lose interest in your blog. To avoid that, focus on creating good content and educating your audience. Seriously, stop selling. If people like your content and think of you as an expert in your niche, everything will fall into place. We’ve talked about written content so far, but your overall content marketing strategy should also involve visuals. Not using visuals is a mistake because humans are visual learners, so they appreciate images and videos as an addition to written content. The 4th Annual Blogger Survey by OrbitMedia supports that by showing that bloggers increase their use of visuals. As you can see from the image below, a typical blog post in 2013 had fewer visuals than in 2017. Visuals are a great way to break up the content into smaller parts and make it easier to consume. Well, just take a look at all the images used so far in this article! And, of course, we’ve got some evidence to prove the effectiveness of visuals for bloggers. 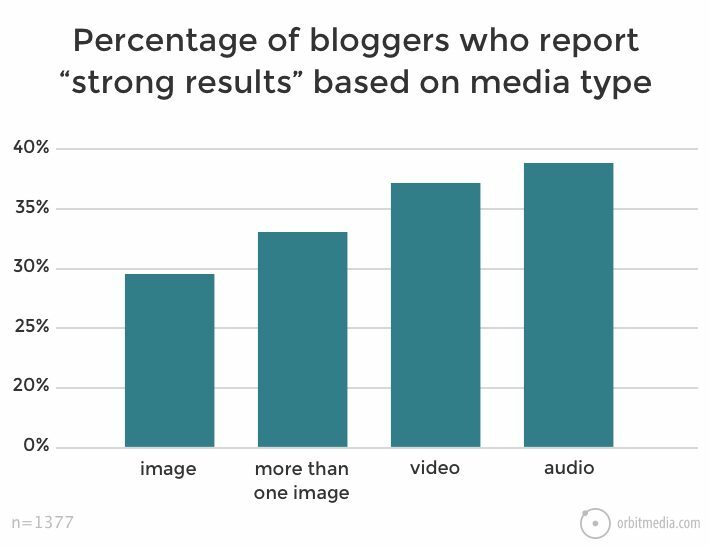 According to the aforementioned Blogger Survey by OrbitMedia, content with images and videos performs better. Here’s what bloggers thought about using various visuals in their content. 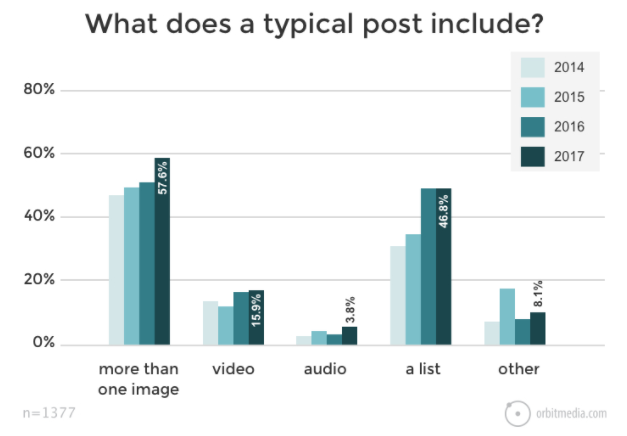 As the data shows, using multiple images is better than using one, and videos are better than pictures. These are the takeaways for you! Proofreading is often overlooked by beginner bloggers, but only one grammatical mistake could easily turn the readers away. It’s simple: mistakes like this automatically mean that well, the blogger is not serious enough about their business. To minimize the risk of this happening to you, always proofread your texts. For example, a common technique is reading out loud. Also, you can use online tools. There are lots of proofreading tools out there that bloggers can use quickly to meet the requirements of their content schedule (we’re going to talk about content schedule in a bit), including Get Good Grade, Supreme Dissertations, and Hot Essay Service. We’ve mentioned a few words about titles, but they require a separate section because they are the first thing that your potential readers see. The first impression is critical in blogging because people have no reason to click on a boring headline. So here are some of the best headline writing practices that you need to know to master it. 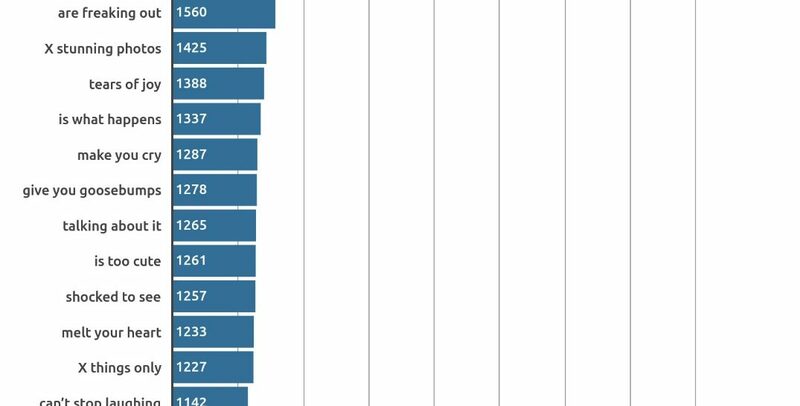 A 2017 study of 100 million (yes, you read that right) article headlines completed by BuzzSumo found that some headlines phrases performed better than others. Specifically, they gained more social media likes, shares, and comments. The image below includes these top-performing headlines. Try using these ideas for your own headlines, and see how they perform. For example, you can apply the most popular phrase, “will make you,” to articles that link something to the readers. Number (10 ways to make your writing skills better). 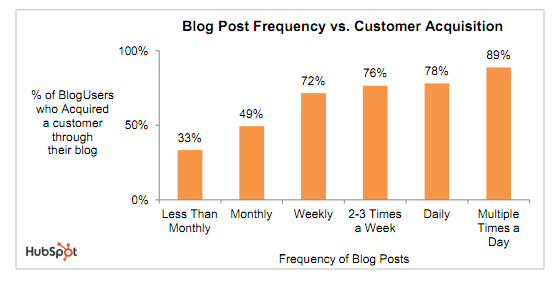 Many new bloggers fail to make a content calendar a part of your blogging strategy. They just post their articles as they complete them because they don’t know how to plan and create stellar content on a regular basis. This is a big mistake because this is an excellent way to organize their content and streamline their communication. Having a content schedule benefits both you and your readers. On the one hand, for you, it minimizes stress and promotes focus to accomplish your short- and long-term goals by posting consistently. Besides, consistent and organized content makes you look professional and reflects well on your personal brand. On the other hand, your readers will also benefit from you using the content schedule. For example, they’ll know when you post so they don’t miss the fresh content and won’t need to unsubscribe from you because you’re posting too many articles. Moreover, having a schedule makes you more prepared for writing, so you’ll create more quality content. Determine your schedule. How often you’re going to post? If you’re not sure, take a look at the results of the Hubspot’s Accordingly, the best frequency to acquire customers is two to three times per week. Identify blog categories. Come up with 5-10 categories that your target audience may be interested in and related to your business. Make a list of keywords that you need to use for SEO. Make a list of topic for next few weeks. Determine some special days on which you have to post. For example, there might be some professional holidays, conferences, or other special events that you need to cover, so do some research on these as well. Create your editorial calendar. Put everything together and use it! Okay – let’s end it here. If you’re a beginner blogger, you probably learned a lot from these 4 common problems. Hopefully, the tips and takeaways described here in this article are useful for you to get a good start and become a successful blogger. With your creativity, hard work, and professional tips – you can do it! Daniela McVicker writes about blogging, copywriting, online education and online business. She is a regular contributor to many websites including Rated by Students and Top Writers Review. Daniela has an unhealthy obsession with writing articles for beginner writers who want to get better.